He just couldn’t help it. Barack Obama went to Dover Air Force Base on Tuesday for the return of the remains of 30 American troops killed in a weekend helicopter crash in Afghanistan. Before his visit the Obama Administration promised there would be no lasting images from his visit. They lied. It was their Photo of the Day. The liberal media respected the rule. The White House didn’t. They posted an image on the White House website. It was their photo of the day. 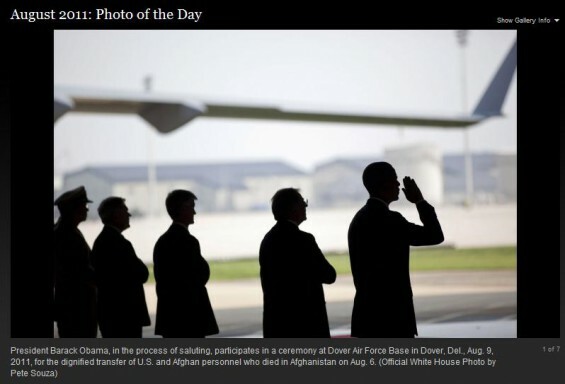 A White House photographer was allowed to take and widely distribute a photo from the ceremony Tuesday for the return of the remains of 30 American troops killed in a weekend helicopter crash in Afghanistan despite the Pentagon’s claim that any public depiction of the scene would violate the wishes of bereaved families.